Back today after sitting the last couple of days out. Being selective has paid off so far in the Stanley Cup playoffs as we’re off to an 8-5 start for +3 units, including a +135 cash with the Rangers in our most recent bet on Thursday. Three more series ended yesterday, with the Blues, Rangers and Oilers advancing to the second round. That just leaves the Ottawa/Boston and Washington/Toronto series in Round 1, and both could end today as well. As good as the first round has been, it’d be disappointing not to see any series go to 7 games. That alone is enough reason to cheer for the Bruins and Leafs today, but we’ll also be cheering for Toronto with our wallets. Below is our take on the Caps/Leafs matchup, along with a couple of bets we’re making. Good luck if you’re following along! We watched Game 5 with a few buddies Friday night, and the common refrain of the night was how you couldn’t tell which team finished first in the NHL this season and which one got into the playoffs on the second-last day. This series has been that evenly played (4 out of 5 games have gone to OT and the shots on goal are virtually the same), but the odds (making the Leafs +130 at home) still imply a big mismatch. We expect the Leafs to come out of the gate with a ton of energy tonight. Even though they lost Game 5 in OT, we don’t think it was a demoralizing loss. In fact, it just reinforced the fact that Toronto can play with the Caps. And if Toronto can get the series back to Washington for a seventh game, all the pressure in the world will be on the Capitals. So even though the Leafs need 2 straight wins here to pull off the upset, there should still be a pretty high belief level in that dressing room. 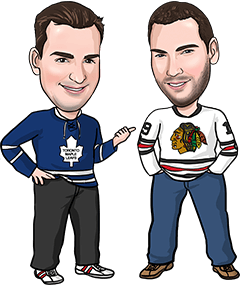 We’re going with 2 first-period bets in this one: One on the Leafs on the first period moneyline (+116 at Pinnacle) and the other on the first period Over 1.5 (we got +102, also at Pinnacle). The Over play is a bit of insurance on the Leafs first period play, since we’re guaranteed to hit at least one bet here if the Leafs score one first period goal, and we could easily hit both as well. First periods have been pretty high scoring in this series (3 goals in Game 1, 3 in Game 3 and 5 in Game 4), and we can see the Capitals letting down a bit defensively after dodging an OT bullet from the Leafs in Game 5.